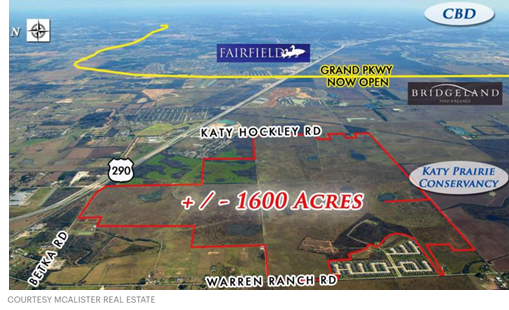 ​​​ HOCKLEY, HARRIS COUNTY – Johnson Development Corp. acquired 1,619 acres off US Hwy. 290 and Katy Hockley Rd. in northwest Harris County for a new master-planned community. Residential growth is moving northwest out toward Waller County as Cypress-area communities fill out and several major commercial projects, including Daikin’s new air-conditioner manufacturing plant in Hockley, draws employment farther out. ​The transaction is one of the largest in the Houston area since the oil slump. A future master-planned community on the property would be zoned to Waller Independent School District.